You are here: Home / Family Travel / Disneyland Parking Fee – Is It Worth It? When going on a Disneyland vacation, some of the smaller things to budget for might get looked over. 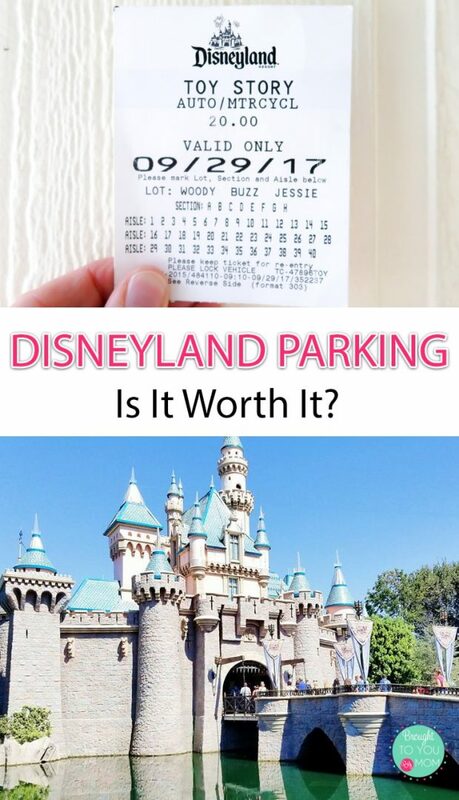 For example, in this article, we will discuss the Disneyland Parking fee and is it worth it? If you’re like me, you might be going back and forth in your mind if it is worth it to utilize Disneyland Parking or not. If you are driving to Disneyland or renting a car, the Disneyland Parking fee is something you probably want to be adding to your budget and here’s why. How Much is Disneyland Parking? The first big question that everyone is going to ask is, “How much is Disneyland Parking?”. Disneyland currently has two designated parking areas. Mickey & Friends Parking Structure and Toy Story Parking Area. Disneyland parking cost at both locations will be $25 per day to park per car or motorcycle. Oversized vehicles, motor homes, and tractors without trailers are $30 per day. Parking for these types of vehicles is now only permitted at the Toy Story Parking Area. Busses or tractors with extended trailers are $35 per day and will also be required to park in Toy Story Parking Area. Prices and availability are always subject to change. Preferred parking is also available for a higher price. When Can I Park in Disneyland? For those of you who are curious about the parking areas times, both parking areas will open one hour prior to the published Disneyland Park opening hours for that day. This also leaves time for those with Magic Morning days to arrive about 30 minutes prior. Why Pay the Disneyland Parking Fee? Now that we have all of the logistics out of the way, the question: “Is the Disneyland Fee worth it?”. I personally budget it into my Disneyland vacation now because after utilizing it, there is nothing easier to help get around at the parks. When I drove up to the toll booths at Toy Story Parking Area, the Cast Member parking attendants were right there to greet me. They exchanged my money for a parking pass and directed me to my parking stall. Can I Purchase Disneyland Parking Prior to Travel? You can purchase parking vouchers prior to arrival or pay-as-you-go when you get there. Each voucher is good for one day of parking for one standard-size car or motorcycle. Parking vouchers are not valid for Downtown Disney District parking or hotel parking, or for oversized or commercial vehicles. Purchasing the parking vouchers ahead of your vacation can make it easier for planning purposes. There is an option to upgrade to preferred parking which you can inquire about at any theme park parking toll booth. I think one of the coolest features that makes it all worth it to me is this silly piece of paper (the parking voucher for re-entry seen below). It has all of the parking area sections and aisle numbers that you mark to remind you of where you parked. Trust me, utilize this. When you get off the busses at night you do not want to be wondering the parking area using your key fob to set off your car alarm to find your vehicle. I have too many stories of this from when I was a Cast Member at Walt Disney World but that is for another day. Speaking of busses, this is another reason why paying the Disneyland Parking fee is worth it. The busses are constantly moving outside of the Disneyland Resort. You will hardly wait for a bus to come to pick you up outside of the parks to return you to the parking area. I have sat for a long time waiting for public transportation buses and it is not fun. They aren’t terrible but I trust Disney just a bit more. There isn’t any waiting for tired kiddos or tired feet when you utilize the Disneyland transportation. There is something about having the comfort of your own vehicle to return to your hotel rather than having to stop at multiple locations to get back from the parks. Getting from Disneyland to my car and to my hotel without hassle is worth the $20 a day to me. How much does it cost to park at Disneyland? If you’re looking for peace of mind and easier access to Disneyland Resort, I recommend utilizing the Disneyland Parking Areas. The Cast Members get you where you need to go quickly. I’ll also mention that it makes you immediately feel like you’re a part of the magic. Who doesn’t want to ride a bus with Disney characters on the sides? Just me? Yeah, I am a big kid at heart. The Disneyland Parking Fee does require some extra budgeting but is well worth the cost. Ready to snack at Disneyland? Check out My Favorite Snacks at Disneyland and Disney California Adventure Park. What Is a Good Age for Disney On Ice?